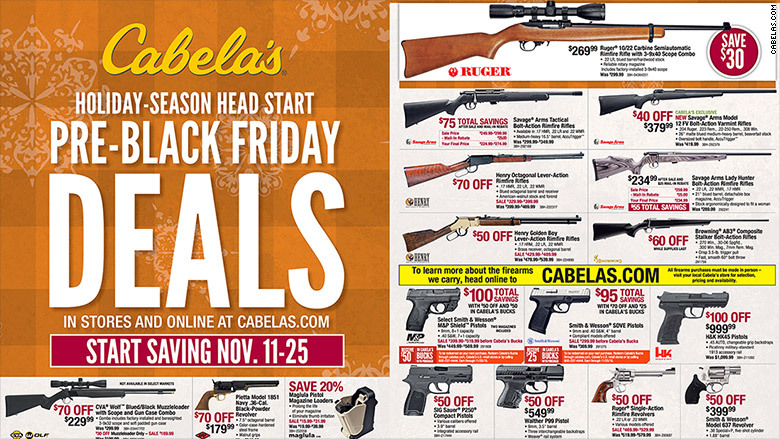 Gun dealers like Cabela's offered discounts for Black Friday, which was the biggest day ever for FBI background checks. Strong demand for guns on Black Friday drove FBI background checks to a record for a single day. The FBI processed 185,345 requests through the National Instant Criminal Background Checks System, also called NICS, on November 27. That's 5% more than the previous Black Friday of 2014, according to Stephen Fischer at the FBI. The number of background checks on the Friday after Thanksgiving beat the prior record for a single day, which was 177,710 on Dec. 21, 2012. That was one week after a mass shooting at Sandy Hook Elementary School in Newtown, Conn.
Background checks are processed every time someone tries to buy a gun from a federally licensed dealer, though do not reflect actual gun sales. Most background checks are approved by the FBI. Black Friday is traditionally a big day for gun sales. Cabela's (CAB), a retail chain for hunters and one of the more prominent gun dealers, offered Black Friday deals on a variety of rifles and handguns. Faxon Firearms, Connecticut Shotgun and the silencer company SilencerCo also advertised Black Friday deals. In recent years, gun sales have been driven by fears of terrorism, crime and more mass shootings. They have also been driven by concerns that gun violence could result in more restrictive gun laws.